Clean washrooms are a must everywhere: from schools, colleges, and hostels to workplace. Hence, it is equally important to monitor their cleanliness on a regular basis. To address this issue, Punjab University launched an app to monitor sanitation. In Oct 2018, Punjab University (PU) launched the use of app—GoWhatsThat—to monitor sanitation of washrooms on its campus. This move is under the Swachh Bharat (Clean India) Mission. The Government of India started Swachh Bharat Abhiyan (Clean India Mission) in Oct 2014. It aims to clean the streets, roads, and infrastructure of India. 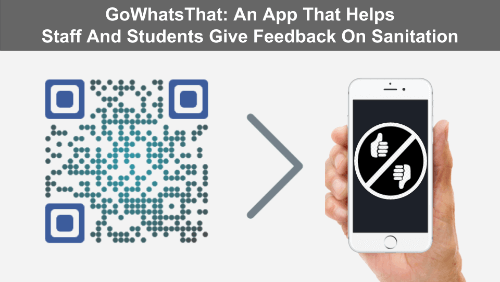 GoWhatsThat app will help hostel inmates, students, staff, and faculty members give feedback about washrooms on PU campus. GoWhatsThat app is an information locator system. It is based on the use of QR Codes and NFC technology. The app was launched in Jul 2018 to monitor the condition of public toilets in Chandigarh, India. “The app-based sanitation monitoring of public toilets is already in use. And I am happy that PU is also becoming a partner in the Smart City Mission. Earlier, we launched this app in Chandigarh for tourists. We placed approx. 1,100 tags at different spots like Rock Garden, Sukhna Lake, etc.”— A Spokesperson, Punjab University (PU). Besides Punjab University, many other Universities are using QR Codes to help their students. Punjab University will extend the use of the app to its museums too. There will be QR Codes/NFC tags to provide information regarding the monuments and artefacts. Besides monitoring sanitation, India and China are using QR Codes to manage city waste as well. QR Codes can help City administrations across the world to track as well as segregate the waste. That’s all you need to know on how Punjab University launched an app to monitor sanitation.